Since 1889, Texas A&M University-Commerce has been known as a leader in providing an excellent education. It’s because we care about people and relationships. We’re a big-name university, but our focus is helping you achieve success. A&M-Commerce faculty and staff will know your name and work closely with you to understand your goals and dreams. Our professors will care about your growth and be your loudest supporters when you walk across the stage to get your degree. We realize a great education is about more than attending class. It’s about making friends, memories, and a name for yourself as someone who’s passionate about learning. Earning an A&M-Commerce degree and being part of the Texas A&M University system will not only look good on your resume, it will give you the confidence you need to compete in the marketplace. Quality: Part of the A&M University system, offering you the knowledge and confidence to compete in the real world. Programs: More than 100 graduate and undergraduate degrees. Faculty: Our faculty are as well known for mentoring students as they are for teaching. Small classes provide a great learning atmosphere where you’re taught on a personalized basis by some of the best professors in their fields of expertise. Research: With a new multi-million dollar science building on campus and some of the most cutting-edge educational models, A&M-Commerce provides research opportunities to undergraduates as well as graduates. Where else can undergraduates develop research projects alongside world-class faculty and graduate students? A&M-Commerce, of course. Students: A diverse student body of approximately 6,000 undergraduates and 4,000 graduates. Honors College: Full-tuition scholarships offered every year to 50 Honors students. Study abroad: 18 programs, including study abroad in Australia, China, England, Peru, Russia, and South Africa. Internships: Real-world work opportunities in nearby Dallas and surrounding communities. Financial aid and scholarships: More than $75,000,000 offered yearly to make tuition affordable. Campuses: Our main location in Commerce, plus several additional campuses and online programs. Diversity: A&M-Commerce is proud of its diverse student population, many who are first-generation college students. We are committed to helping you feel at home and providing the support, encouragement, and attention you need to succeed. You’ll make friends with students from many different cultures and backgrounds. Great place to learn: Excellent facilities, including a state-of-the-art science building, new Student Center, and recreation center. 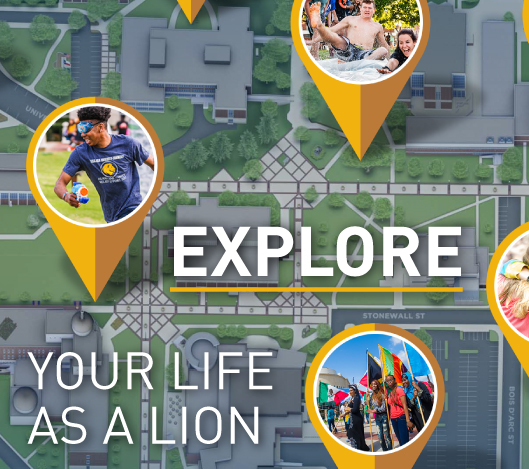 Activities: Make lifelong friends and enjoy a vibrant student life with more than 120 student organizations, plus recreational opportunities. Graduates: More than 95 percent of our 2006 graduates are employed or attend graduate school, where they excel in their chosen fields. They are sought after in the marketplace for their knowledge, skill, confidence, and ability to use their education to solve real-world problems and make a difference in whatever careers they pursue. Texas A&M University-Commerce offers a challenging education in an easy-going environment. You’ll make lifelong friends, meet professors who’ll make a difference in your life, and prepare yourself for a future filled with possibilities. Call today to learn more: 903-886-5000.